Our wedding tasting events are planned with varying menus so that you can choose the date and menu offering that will best suit your needs. • Cocktail Hour – featuring butler-style hors d’oeuvres, chilled and hot stations, and displays from our wedding package. • Four Course Dinner – two courses prior to the entrée, four choices of entrée, a dessert course, a wedding cake sampler and a specialty dessert. • Top-shelf open bar throughout the event and an enhanced station of the day. 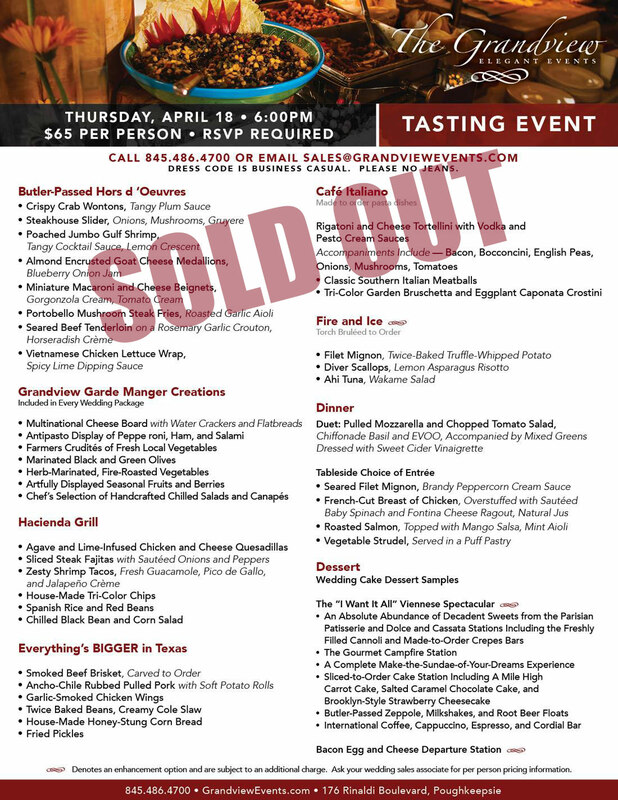 Tasting events are by reservation only and limited seating is available. Please call us at 845-486-4700 with your reservation name, number of guests in your party, wedding date and the date of the tasting you would like to attend. We look forward to seeing you at one of our tasting events!